Peter Brewis farms extensively an arable / grassland unit on the North East coast of Northumberland. He has a closed herd of 200 Stabiliser breeding cows, buying only bulls. 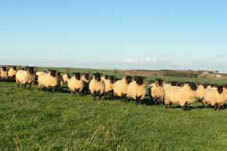 He runs 1000 ewes, 350 Mules and 650 Essie Suffolk cross ewes. The sheep are used as an important break in the crop rotation, adding fertility and organic matter to the soil. Peter has bought Essie Suffolk rams for more than 8 years, replenishing rams as required – sometimes 2 or 3, sometimes only 1 because the older ones are doing fine.